Self adhesive, reusable, dramatic eyewear in sparkling colors. Can be removed and reapplied many times. Can be worn for days without removal. Comfortable enough to sleep in. Adhesive backing is very sticky, so these are great for stage wear and for hot environments like Burning Man. Does not include eyelashes, feathers, costume, hair piece, or other eyemakeup. To see all of our Eye Makeup Strips and instructions for application, click here. 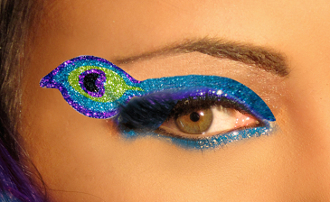 To see all of our Body Art that goes well with these Eyes, click here.